Trust has been lost, time has run out, and the bailout that runs out tomorrow [Tuesday] is not going to be extended until after the referendum in Greece next Sunday [6 July 2015]. Politicians and commentators alike are speaking about inevitable aftershocks. But the truth is it is impossible to say what the week ahead holds for Greece, let alone what Greece is going to have to endure after the referendum. 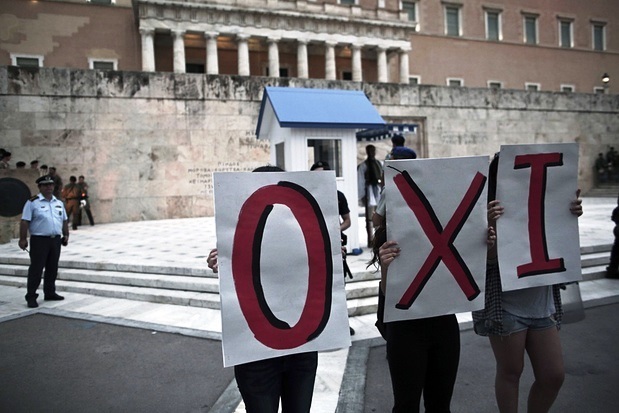 The Greek government is likely to run out of money to pay pensions and public sector salaries. It has already stopped paying suppliers, many of them are being pushed to the wall, and businesses and individual taxpayers are withholding their payments. The one certainly is the Greek collective sense of resilience in the face of insulting ultimatums or overbearing and overpowering pressures and from outsiders. The last time a referendum was held in Greece was over 40 years ago, when Greeks voted for the abolition of the monarchy on 8 December 1974. Before they fell, the colonels’ regime had already staged a plebiscite on 29 July 1973, establishing a republic. However, after the fall of the colonels, the new government, under Constantine Karamanlis decreed all military actions had been illegal, and a new referendum was called. The proposal from the Karamanlis government was backed by 69.2% of voters with a turnout of 75.6%. Indeed, in Crete more than 90% of the people voted or a republic, and in about 30 constituencies the vote for a republic was around 60-70%. The Greek nation today is caught in a sense of uncertainty not just about the future, but even about the present. But throughout the last two centuries, Greeks have responded to war, invasion, occupation, civil war, uncertainty, instability, economic depression and political oppression with a strong collective sense of resilience. In 1940, the Greek Prime Minister, Ioannis Metaxas, responded to the war-time ultimatum from invading Italians and Germans with a single-word laconcic riposte: «'Οχι» (“No!”). In the past, the traditional Greek safety nets in any economic crisis were the family, the black economy, seasonal tourism, emigration and the pensions of parents and grandparents. But the old certainties can no longer be relied on in the same way. Pensions are withering away, more family members are dependent on them, the black economy is the target of all clampdowns, and if the Troika negotiators are to get their way, increased VAT levels on tourism may kill off many centres of popular tourism. The collective sense of uncertainty was visible throughout the weekend in the endless queues outside ATMs throughout Greece. The banks are going to close today in an attempt to avoid financial panic. But are they going to open tomorrow? Is there going to be a problem about accessing personal cash? Are wages, pensions and bills going to be paid? Is there going to be a run on the banks? Greeks will be restricted to taking out just €60 a day for the next week, some reports say tourists may have access to up to €200 a day, and the banks are not going to re-open until next Tuesday (7 July), two days after the referendum. This may be a minor inconvenience for tourists this week, but for people who live in Greece access to their deposits could become a major crisis, with severe anxieties about savings, about paying bills, about paying for day-to-day necessities. 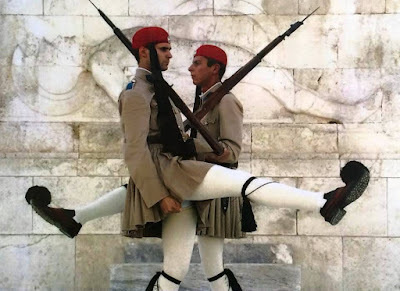 The collective sense of resilience is symbolised for many Greeks in the Tomb of the Unknown Soldier (Μνημείο του Αγνώστου Στρατιώτη), at the bottom of a high wall surrounding the Parliament Building in Syntagma Square, Athens. Protesters have gathered along the top of this wall constantly in recent days and nights. The wall displays a relief that depicts a fallen soldier, and is surrounded by quotations from the funeral oration by Pericles. To the left and right are further inscriptions that tell of historic battles where Greek soldiers took part – the most recent one in Cyprus in 1974, the year of the last referendum in Greece. The Tomb of the Unknown Soldier is is guarded day and night by two Evzones from the presidential guard, dressed in traditional uniforms. Every hour, the ceremony of changing the guard takes place at the Tomb, and once a week, at 11 am every Sunday, the official guard change takes place. The monument was inaugurated on 25 March 1932. The central sculpture by Kostantinnos Dimitiradis is a low relief depicting a dying hoplite or citizen soldier of Ancient Greek. These hoplites or citizen soldiers were armed with spears and shields and their main tactic was the phalanx formation. They were primarily free citizens – farmers with property or artisans – who could afford the bronze armour suit and weapons. Then, as now, the people who could afford it bore the cost of maintaining the security of society, and they did it with characteristic Greek resilience. In classical Greece, the survivors of a battle gathered their dead and placed them on beds for the funeral rituals. They also placed on each bed several personal belongings of the dead soldier. In addition, there was one more bed that was ready, but empty. It represented those soldiers who had died in the battle but had not been found. These unknown soldiers did not remain unsung heroes, and their heroism was celebrated too. On each side of the sculpture of the dying hoplite there is an inscription with a quotation by Thucydides from the Funeral Oration by Pericles. On the left is written: «Μία κλίνη κενὴ φέρεται ἐστρωμένη τῶν ἀφανῶν», “and one bed is carried empty, made for the unknown ones” (2.34.3). On the right are the words: «Ἀνδρῶν ἐπιφανῶν πᾶσα γῆ τάφος», “The whole earth is the burial ground of famous men” or “For heroes have the whole earth is their tomb” (2.43.3). Philip II of Macedon, father of Alexander the Great, once sent an ultimatum to Sparta, warning: “If I invade Laconia you will be destroyed, never to rise again.” The Spartans replied with a single word: “If” («αἴκα»). Neither father nor son ever tried to capture Sparta. It is this collective and communal resilience that has been displayed by Greeks throughout the present crisis so far. 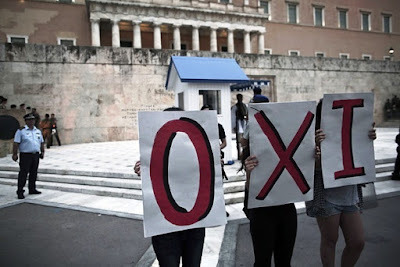 The government party, Syriza, has called a mass rally in Syntagma Square tonight to say «'Οχι» (“No!”) to austerity. It seems the Greek answer in Sunday’s referendum to demands that are seen as being made primarily by Germany is going to be expressed once again, like Metaxas, with resilience in that simple yet laconic, single-worded reply: «'Οχι».